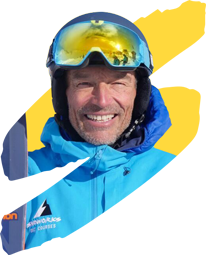 Mike Jones, Snoworks client, describes his journey from a ‘plateau’d’ intermediate to a competent all-mountain skier. It is not easy passing through Boston airport with a broken leg not yet in plaster – the left leg was not much good either as I had ruptured the medial ligament on my very first ski holiday some three weeks earlier. Eventually both injuries did repair and some months later I resumed training at my local ski slope in Torquay, I was by this time hooked on the sport and determined to get the best of this strange but vastly rewarding pastime. My boys, well two of the three seemed to glide down the slope with consummate ease, how was this possible? I was only in my mid-forties and yet resembled a constipated gorilla on the slopes!! Early one Sunday morning in October in typical British drizzle my youngest son and I were the only two on our local slope. Ron, the slopes coach, as usual focused all his attention on my son whilst I was left to perfect the bad habits I had already acquired. Driving home my son was pouring over a flyer that Ron had thrust in his hands – “Tell yer Dad to get in touch with this company,” were his instructions. We booked on our first pre-Christmas All-Terrain course in Tignes and as we queued for the funicular at Val Claret on the first morning I recall it was cold, raining and visibility was very poor. I had been placed in the lowest group and my boys had made it to the top group. Typical! There was an air of trepidation as many of us were intermediate skiers more comfortable on perfectly groomed runs. Blue sky would have eased the tension. As we emerged from the funicular at 3200m we were greeted with the majestic view of the snow clad Grand Motte glacier and blue sky. We had a great day, the tuition was of the highest standard and in English to boot. The week progressed, as did my skiing, every day was filled with enjoyment and improvements. I went home a much more competent skier. At the end of the season I decided to book the same course for the following November. It was my second season on the slopes and my ski buddies, all of whom are experienced skiers, were bemused to see that I had begun to match them in terms of speed, endurance and coping with all the different types of snow and terrain. After seeing my improvement seven of my ski buddies joined me on the Snoworks course the following November. All of us ski to a much higher standard now thanks to Phil and his carefully selected group of expert coaches. I am now a competent all mountain skier and can ski most places on and off-piste. I am not daunted any more by bad visibility, fresh snow, bumps or ice. I enjoy looking for challenges and feel confident that I can cope with most of what the mountain can throw at me. The enjoyment I now have from my skiing is immeasurable and have progressed to the Backcountry and Ski Safari weeks where the all day format allows me to experience even more of the whole mountain. I would recommend Snoworks to any aspiring skier. 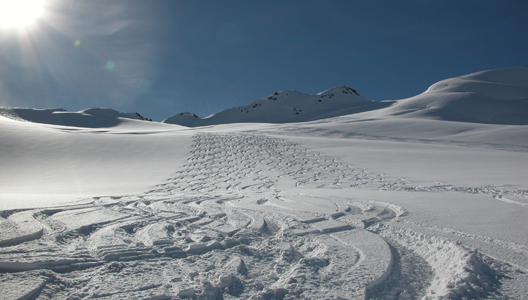 Snoworks run intermediate Level 3 and adventurous intermediate level 4 All -Terrain courses throughout the winter on specific dates along with Backcountry and All-Terrain Safaris for level 4 skiers and above.